Amanda Abreu shines her light in this beautiful example of how Intentional Creativity empowers us to stay centered and supported, as life events are experienced in all shapes and sizes. 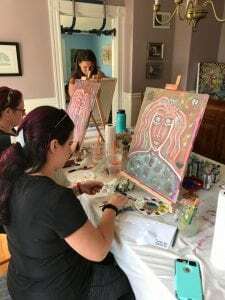 Amanda’s keen ability to stay mindful and attuned to her intuition in trying times, demonstrates the very framework of Intentional Creativity in motion. 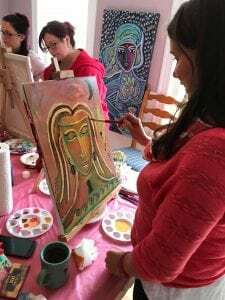 Holding space for members of her community as a teacher, while witnessing and honoring her own feelings, truly brings home both the theme of her workshop, Muse the True You and her aptly named website, Find Joy in the Chaos. 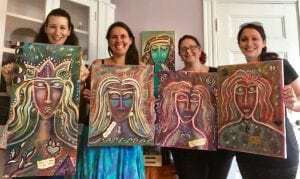 Amanda, while finishing her final weeks of Color of Woman Teacher training, recently lead a 2-day workshop, Muse the True You, an Intentional Creativity journey behind the masks we wear, to discover our truest selves. 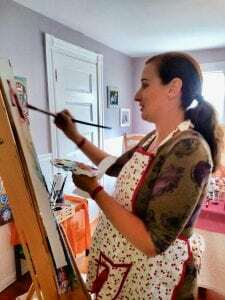 Held on two consecutive Sundays, the flow of the 2 class days, and Amanda’s resilience were tested, when gas explosions in the area called for immediate evacuations. Pregnant and with her husband and two young children in tow, compounded the individual stress and chaos of being thrown into such a sudden life event. Returning to the house after several days, electricity was turned on, but no hot water, heat or gas, yet Amanda carried on with the workshop as scheduled. “I told the women during the workshop that the evacuation really helped me tie into the theme of the workshop. I had been having a really hard time with being displaced and not having access to our home. Everyone kept telling me to be grateful, it could have been worse. And I told the ladies that leaning into the theme of the workshop, and in being my authentic self, it was ok if I wasn’t 100% positive. I had a right to be imperfect and have meltdowns and be “too much” when I needed to be. I didn’t need to fix myself because other people thought I had the wrong perception.